Our spring loaded retractable hangers fit wormdrive saws, framing nailers and coil nailers. 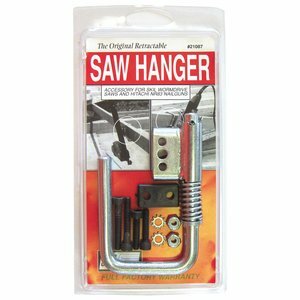 ToolHanger rafter hooks help construction workers safely and securely hang wormdrive saws and pneumatic tools on rafters, I Joist and trusses – protecting your tools where you work. With ToolHangers – No more lowering your tools to the floor below or “digging in” your power saws. Keeping them close by saves you time and money. Now your only repairs will be fixing the cords cut by the new guy! If you’re working with nailguns, saws, coil nailers, and other construction tools high up on rafters our Tool Hangers will make your job easier while helping you keep your tools close at hand so you can work faster. Our tool hanger rafter hooks work with many construction tools including: Bosch, Hitachi, Makita, Max, Paslode, Senco, Skil, Stanley Bostitch,and Porter Cable. If you have any questions about this product by Toolhangers Unlimited, contact us by completing and submitting the form below. If you are looking for a specif part number, please include it with your message.